Selkirk Community Pool is located in the Lord Selkirk Regional Comprehensive Secondary School, "The Comp", and is operated by the Lord Selkirk School Division. and is the largest indoor aquatic facility in the Manitoba Interlake. SCP opened on April 20, 1975 with funds raised through community organizations and donors. Facilities were updated by LSSD in 2013, concluding in a grand re-opening ceremony and updated programming. SCP boasts a combined staff of 30 professional swim instructors, lifeguards, coaches, and fitness experts. 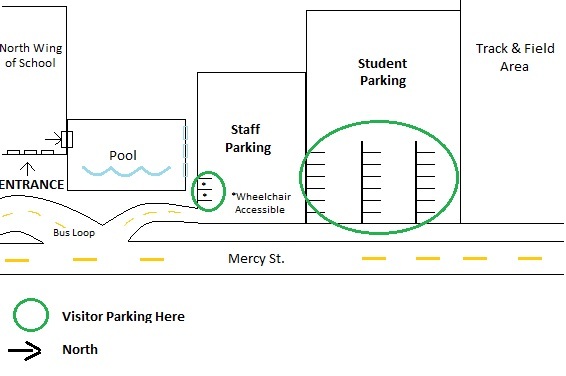 Our parking lot is shared with students and staff of the LSRCSS, and is accessible via Mercy Street. Assigned parking is strictly enforced from 7:30 AM - 4:00 PM, Monday to Friday, September through June, excluding holidays. Pool users must park in assigned visitor parking during school hours, and register their vehicle on the pool deck or in the main school office. The majority of visitor parking is located in the student lot, identified by signage. Wheelchair accessible parking is available in the staff lot closer to the school entrance, also identified by signage. Diving Boards / Starting Blocks: 1 & 3 meter spring boards, as well as 5 non-slip starting blocks. Lane Ropes: Non-Turbulent, 4 ropes available (5 lanes, as needed). Access: 6 Ladders (2 shallow, 2 medium, and 2 max depth), as well as one portable aquatic lift (PAL) and one Hoyer lift. Elevator Access / Wheelchair Accessible: Yes, internal school elevator available upon request. Note: Pool is divided at the 25m. mark by a steel bulkhead, providing a 5m/32" depth barrier for pre-school swimmers. For team wind-up's, birthday parties, and special event bookings, call or email to book the pool in one hour intervals $90.00 + GST, including lifeguard staff. Lifeguard's have full authority- Safety First! General Rules: No Person with a communicable disease or open sore may enter the water. No food/gum. No Glass Containers. Walk with extreme caution- pool deck is very slippery. Diving permitted in deep water only. Diving Boards/Blocks: Use regulated by lifeguards, based on safety, programming and pool spacing. Note: PFD's can be worn off the 1m board, but are not permitted on 3m board. Supervision: Children under the age of 8 must be accompanied by a parent, guardian, or babysitter/supervisor during public recreation swim programs. We enforce " WITHIN ARMS REACH". Viewing: Non-swimming spectators must view from the upper gym area. Parents may drop-off & collect on deck 5 min prior. Photography/Video: The use of photographic equipment, including cell phones, is not permitted in the changerooms and the pool area. NO photos are allowed to be taken from the upper viewing area. If you wish to take a photo of your child(ren) please ask the supervising staff on deck. Showers: All patrons must shower before entering the water. Footwear: All patrons, including those dropping off or picking up, must wear clean indoor shoes in shower, and on deck areas. Minimum Height Requirement: 36" to the chest (pre-school swimmers who do not meet this requirement must be screened for safety and ability, or register in a Parent & Child class). Change Rooms / Lost & Found: Children 7 years of age and older must change in their gender specific change rooms. Limited Locker space is available. Locks are not provided. Participants are advised to bring their own locks and to keep personal items to a minimum. The Lord Selkirk School Division is not responsible for lost, stolen, or damaged articles. Found articles will be held for a time in the LSRCSS lost-and-found. Attire: Swimsuits must be worn in the pool; T-shirts/shorts are permitted but cannot be 100% cotton. Swim Diapers: Standard diapers are not permitted. Swimmers who require diapers on a regular basis must wear snug fitting waterproof pants over a cotton diaper, or wear specially designed swim diapers or swim pants. Pool Fouling: Occasionally, swimming pools are subject to unforeseen fouling. Health regulations require that we close temporarily to allow for disinfection of the water. Additional classes may be scheduled where possible, otherwise classes will be continued on deck (dryland). Please try to have your children eat their meal after swimming or two hours before. if your child is not feeling well do not force them to swim. Inclement Weather Closures: In the event of dangerous weather, SCP closes in conjunction with LSSD. Participants who commute for programming are advised to call ahead or check our website prior. Make up classes will be offered where scheduling allows. No refunds or credits shall be given. Receipts: Will be emailed via online registration, or available on the last class if requested. Report Cards: will be available on the last scheduled day of classes. If you are not able to pick up your report card it will be held for 1 year for pickup at your earliest convenience.